Director: Lynne Ramsay. 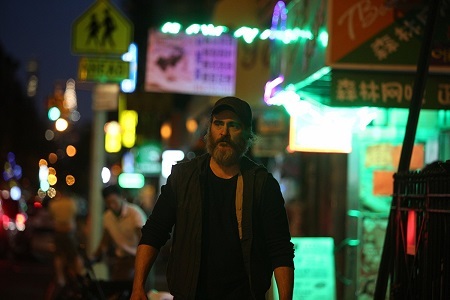 Cast: Joaquin Phoenix, Ekaterina Samsonov, Judith Roberts, Alessandro Nivola, Alex Manette, Dante Pereira-Olson, Kate Easton, John Doman, Frank Pando, Vinicius Damasceno. Screenplay: Lynne Ramsay (based on the novel by Jonathan Ames). Twitter Capsule: Manchester by the Charnel House. Too bullish a showcase for its own serrated craftsmanship? Still: wow. VOR: ④ Ramsay's intrepid experiments with cinematography, sound, and editing remain vital even when they miss the bullseye. Major work from Phoenix, too.